Steel belted radial construction offers performance advantages in tread life, fuel economy and handling over equivalent sized bias ply tires. 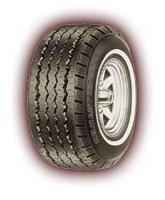 The low rolling resistance of radial tires means low towing resistance for excellent miles per gallon on long hauls. Flexible radial sidewalls provide a smooth, soft ride to help protect the precious cargo of towed trailers, boats and campers. A special arrangement of the tread elements helps keep noise levels low.